Now . . . . . this scene may not look that swell, but Abby was chewing on an Elk hoof for only a few seconds before Rick showed up and Keeper is only sniffing. Nevertheless, these are the visuals that come with the descriptions found in Goldentales. 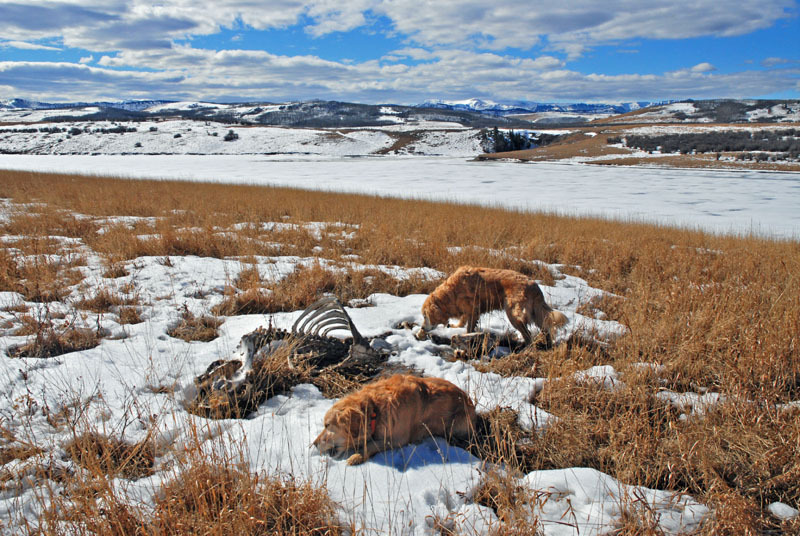 The prairie is surprisingly littered with dead things, the natural cycle of life, and walking, walking, walking will eventually uncover them . . . . which, as you might imagine, was the highlight of Abby's day. In reading the stories of Abby & Keeper's Epik Journies or the new adventures of Pete & Ruby you may have concerns about their descriptions of chasing various local critters. The humans go out of their way to keep Pete and Ruby away from deer, coyotes, elk, moose and other creatures when out on walks. Typically, the humans see these animals long before the Pete and Ruby and can thus take a detour around their location. In any event, the wild animals are usually very alert and hear us coming first. However, in their lifetimes, Abby and Keeper DID sometimes find a deer before the humans and, yes, they were involved in a chase or two. The deer are far faster than the dogs and are thus in no danger - not that Abby and Keeper would have known what to do even if they caught one. Pete and Ruby still haven't had that experience and we hope they won't in the future either. From Pete & Ruby's perch high atop the valley, they have seen coyotes trying to catch deer with no luck. Deer have lots of practice running from coyotes and local farm dogs. Pete & Ruby's four acres are fenced, post and rail, with a wire inside to prevent them wandering off. Deer sometimes come inside the fence, poking around the yard and looking in the windows to see what's on TV!!! 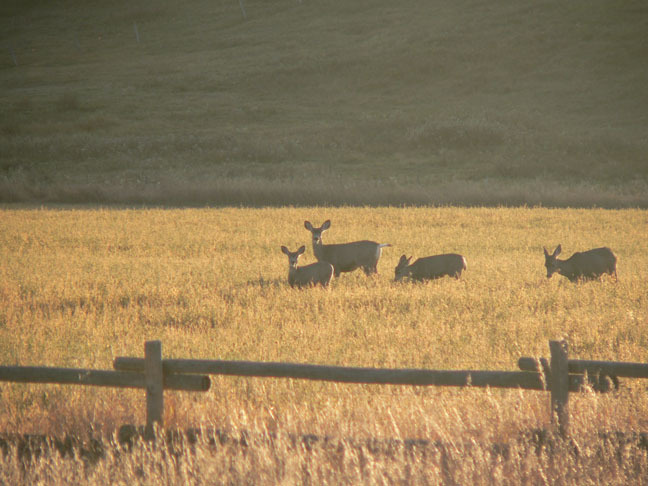 A golden field of deer at sunset. It is a fact of rural life that raspberry patches, gardens, flower beds, young trees, etc, are deer magnets. Pete & Ruby will often chase deer out of the yard, usually in the morning. Unfortunately, the occasional gopher - otherwise known as a Richardson Ground Squirrel - will stray inside our fence and the dogs, being far faster than ourselves, inevitably catch the poor creatures. Some gophers survive the experience, some do not. We have moose in the area and sometimes one will wander right into the yard. Moose are usually unafraid of the dogs. Lots of barking and glaring but nothing much happens. Coyotes in packs of three or more are dangerous to the dogs. This situation represents the biggest worry when out on Epik Journies. Pete and Ruby are a little smaller than Abby and Keeper who were basically the same size as a typical coyote. 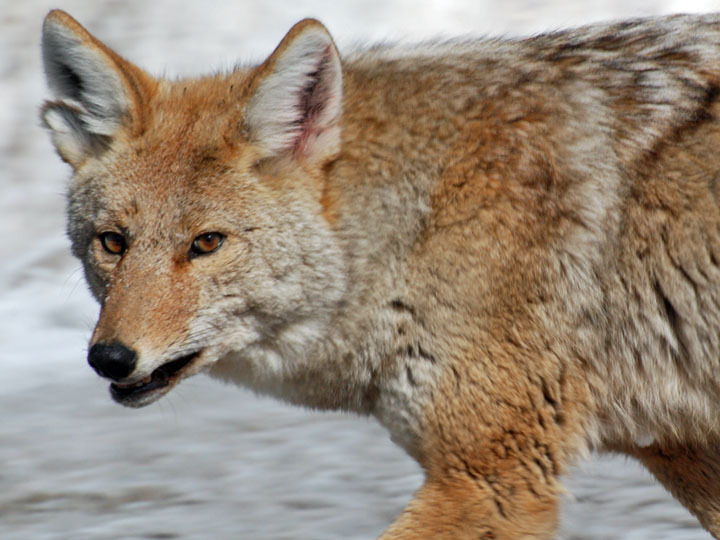 The average coyote, however, is a full-time predator. Female dogs in the country are often left alone by coyotes. A dog which chases coyotes, however, usually doesn't live long. Hence the fence surrounding the property, preventing Pete and Ruby from leaving and mysteriously, the coyotes never enter. Abby & Keeper had a bear encounter and a cougar encounter in the mountains in their lifetimes. Fortunately, that's yet to happen to Pete & Ruby. Keeper confessed in a story that she chased a horse for a short ways. There was only one such incident. Her primary focus after that was sniffing noses with horses. In one of the stories there is a reference to the "traps" I set for "gophers" out on our four acres. These critters are actually Northern Pocket Gophers - subterranean gophers which rarely come to the surface. They dig large numbers of tunnels and leave huge mounds of dirt around, destroying any lawn area they might inhabit. We didn't move to the country to harm wildlife but unfortunately these guys have to go!! The traps take care of the task humanely. A daring coyote eyes Abby as she pokes her head out the window of the Durango. This coyote was cheeky, trotting down the middle of a mountain road and unafraid. It has probably had success with domesticated dogs at campgrounds, luring them away, hence it offering itself for a chase. Abby was identified in a personality profile before she arrived as a puppy in the country that she would be "willful and very intelligent." She lives up to both labels. Although Abby did attend puppy classes she was obedient when she wants to be and the humans accepted her for what she was. This is sometimes a problem on Epik Journies as noted from Abby's point of view in some of the stories. Ruby is turning out to be fairly similar to Abby in that regard while Pete has some Keeper-like traits. Both Pete and Ruby, as with Abby and Keeper before them, are well socialized and enjoy people and other dogs. 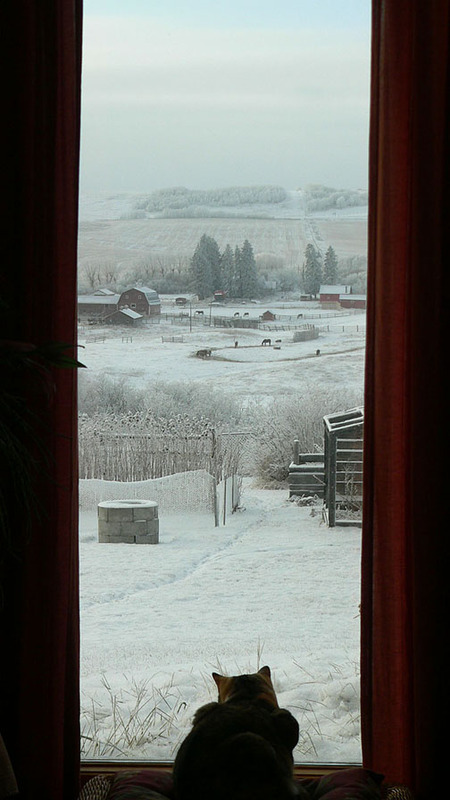 Lastly, Pete and Ruby live between the communities of Okotoks and Millarville, about 25 minutes south of the city of Calgary. In Canada, words like "colour" and "flavour" are spelled with a "our" instead of the Americanized "color" and "flavor." Not that dogs are very good spellers as you may have noticed!!! Polly contemplates a frigid winter morning from the safety of her perch by the window.